Stephen Riley Photography: Somerset: Photography out and about in Somerset and Dorset. Photography out and about in Somerset and Dorset. OK, so everyone photographs this place, but as a professional photographer in Somerset, Dorset and environs, I must be no exception, and I have to have this in my portfolio. As you can see, I have also given it the obligatory ‘olde worlde’ treatment in Lightroom. 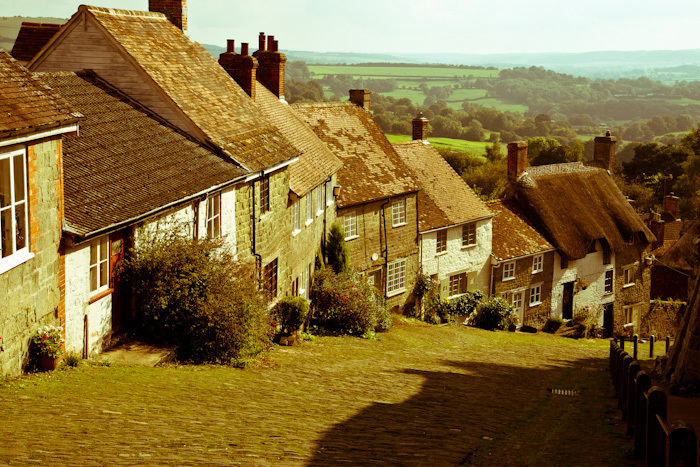 It is of course Gold Hill in Shaftesbury – surely one of the most photographed locations in the land. Ironically, the thing it is most famous for is that Hovis advert, with which few can be unfamiliar; its beauty as a piece of idyllic English landscape comes a close second. The advert is of itself a curiosity in the context of the location. Looking at all the elements in it, it is riddled with contradictions. Firstly, although Gold Hill was chosen as a suitably scenic location for the ad, it is in Dorset, when the narrative is evidently set in some unspecific location hundreds of miles away. The ‘story’ is of a young lad delivering bread in what we must assume is his home town. However, he has a northern – Lancastrian or Yorkshire – accent, leading us to place the ad somewhere in early twentieth century northern England. Hovis itself came from a company first founded in Macclesfield in Cheshire, which just scrapes into the English North West, whilst abutting the West Midlands. Then there’s the music: part of Dvorak’s 9th (the ‘New World’) Symphony; an extract from the slow movement. He was a Czech composer; the music was written whilst he was in the USA and is regarded as a tribute to it. Dvorak himself refers to being influenced by Native American music in his creation. Of course, the reason the piece of music works as a signifier of the North of England comes not from the composer, but from it being a piece favoured by many northern brass bands, and it is a brass arrangement that the advert uses. So we have Czech music, about America, laid over an advert placed notionally in the North of England, whilst really depicting the South. With all this in mind, the ad becomes a truly cosmopolitan phenomenon, and not the parochial thing it pretends to be. There is another layer of 'meaning', too, in Tony Capstick’s wonderful parody, ‘Capstick Comes Home’, which brings together the music, overtones of the Hovis ad and allusions to Monty Python’s ‘Four Old Yorkshiremen’ sketch; that’s the one where each vies with the others for having had the most deprived ‘Northern’ upbringing.